Yep. My hand’s in the air too. Would I love to go on that two-week escape to Ireland that Groupon has offered me? Sure, but, two weeks of vacation? I can’t remember the last time that happened. Cheap flight deals for next month if you book by Friday – those sound great. Did someone fall asleep, though, and not hear that more and more of the workforce is shifting to freelance? Who can know for certain that they’ll be free during such a specific, short window of time? We need a tool for getting away that’s better suited for our modern work schedules. Who’s ready to dust off the carry-on with me? I’m about to share a travel startup that I love, love, love. 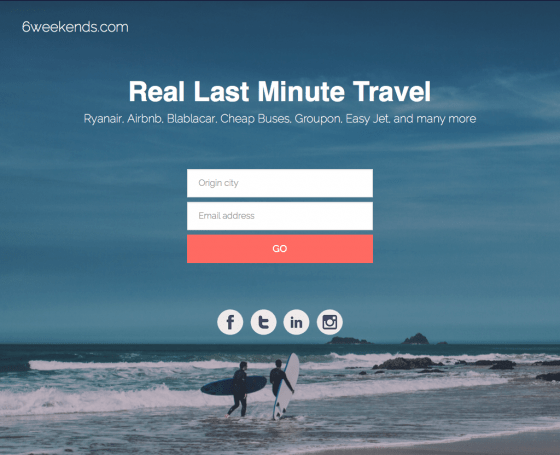 6weekends is a service that hooks you up with last-minute getaways. They aggregate travel deals from around the web and present 6 potential, low-cost reprieves from our insane lifestyles. This is so great. 6weekends connects the dots between travel deals that, when left unconnected, make planning so complicated and time consuming. Transportation, accommodation, ticketing – they combine the best cheap offerings online so that you can afford to get away and do so in a hurry. 6 weekends is a smart tool for the spontaneous adventurer and time-strapped traveler. They eliminate the need to search for deals on multiple sites. It’s so frustrating to have, say, an airfare deal dangled before you when you can’t find any reasonable hotel rooms for the same time. 6weekends spares such pains, covering all the angles so that you can just go, go, go. Another attractive feature of 6weekends is that they don’t bombard you with offers. Each week, you receive one message with the six deals via email or WhatsApp. Better yet, there aren’t any fees for the service. So it’s like you have your own last-minute travel agent that finds a getaway your travel agent probably wouldn’t find to begin with – and you can enjoy a brief holiday when you can actually step away. Oh, and you can afford it! Hallelujah! I love travel, but as a parent and hardworking man, I’ve had to ditch the notion of long holidays. I’ve been looking for help with last-minute planning, but haven’t seen anything like 6weekends until now. I may even stop crying when I see travel packages geared for weeklong holidays with a more realistic option in hand. Score your own personalized, last-minute deals at 6weekends.com.